Dongguan Sinowon Instrument Co., Ltd.
Ultrasonic hardness tester SU100 apply ultrasonic contact impedance method to do comparative hardness measurement for testing pieces, with advantages of high accuracy, efficiency, portable and easy operation. At present, there are kinds of methods for hardness measurement, commonly used like Brinell, Rockwell, Vickers, Leeb, etc, while the disadvantages are obvious for above hardness measurement methods. Rockwell and Brinell with heavy loading force and big indentation, lead to serious destructive on sample surface. Vickers apply optical measurement, but only professional technicians can smoothly operate, impossible to measure hardness of heavy work piece, installed machinery and permanently assembled parts. Ultrasonic hardness tester SU100 is widely used to measure hardness of small forgings, cast material, weld inspection, heat affected zone, Ion-nitrided stamping dies and molds, forms, presses, thin walled parts, bearings, tooth flanks, etc. ● Simple Calibration — Save 20 groups calibration data for invoking, improve calibration efficiency. Data display Loading force, testing-times, Testing result, Average, Maximum、Minimum、deviation and conversion scale. ● At present, there are kinds of methods for hardness measurement, commonly used like Brinell, Rockwell, Vickers, Leeb, etc. ● While the disadvantages are obvious for above hardness measurement, Rockwell and Brinell with heavy loading force and big indentation, lead to serious destructive on sample surface. ● Vickers apply optical measurement, but only professional technicians can smoothly operate, impossible to measure hardness of heavy work piece, installed machinery and permanently assembled parts. ● Leeb hardness tester apply rebound and indirect method to measure hardness, easily lead to big deviation when convert to Birnell, Rockwell and Vickers scales. Ultrasonic hardness tester SU100 apply ultrasonic contact impedance method to do comparative hardness measurement for testing pieces, with advantages of high accuracy, efficiency, portable and easy operation. 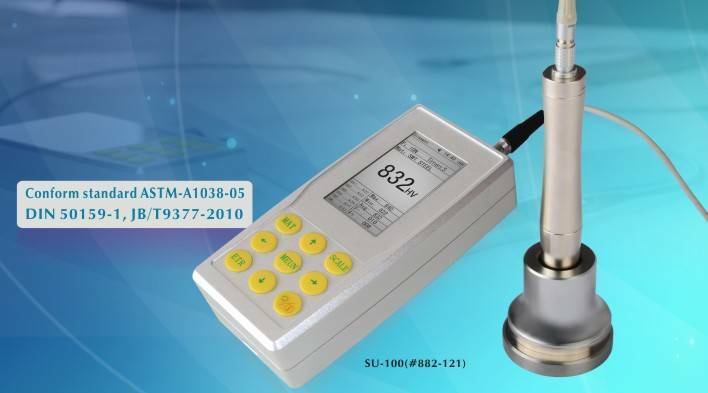 ● Ultrasonic hardness tester SU100 is widely used to measure hardness of small forgings, cast material, weld inspection, heat affected zone, Ion-nitrided stamping dies and molds, forms, presses, thin walled parts, bearings, tooth flanks, etc.